This one’s for my German readers. 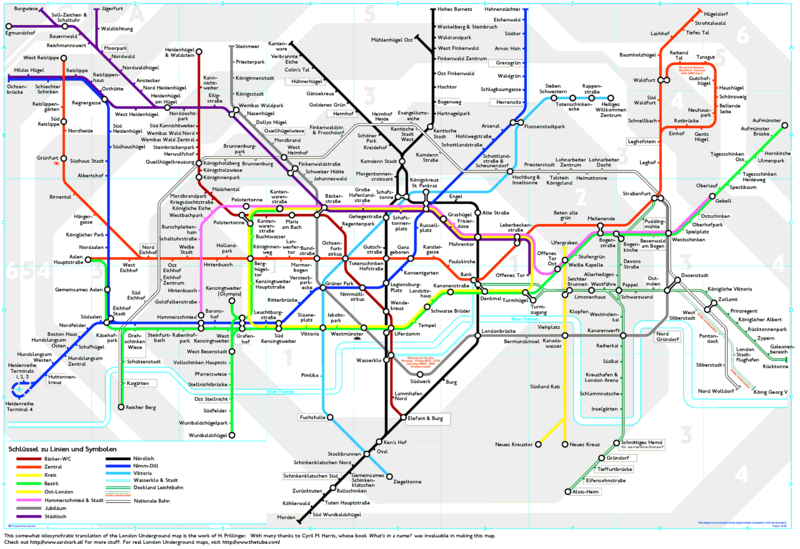 The London Underground map has been translated at last! For reference, here is the standard London Underground map. Here is a very interesting and entertaining video about the history of the English possessive. As I was watching the video, I was struck by the close relationship between German and English. Both languages use the possessive, but English did away with complex possessive endings during the late middle ages, along with most other “case” forms, and replaced those cumbersome endings with the apostrophe-‘s. Unfortunately, German retained its complex grammar, including the possessive endings, which are part of the Genitive case. As I have said many a time, learning German is no easy task, and “cases” are a prime example. German has four cases: Nominative, Accusative, Dative, and Genitive. 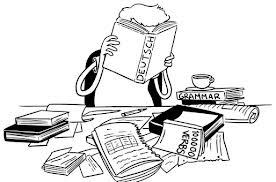 Cases are an important part of German grammar since they dictate the endings of adjectives, indefinite articles, and pronouns. The man gave the dog to the nice young girl. Those 12th century English speakers were on to something when they did way those possessive endings! Over the years, I’ve tried a number of German language schools in Berlin. The quality of the instruction varies, and price is no guarantee that a course will be good. Here are a few tips. The Goethe-Institut is top-notch, but quality comes at high price. A four week course will run about 1000€. Located in Mitte, the Goethe-Institut has an excellent library, classroom visual aids, computers, Wi-Fi, and German DVDs and CDs for loan. The Goethe-Institut is aimed at short-term visitors and university students. There are plenty of extracurricular activities, including tours of the city, organized excursions to the opera, theater, and other entertainment venues. The quality of the instruction is generally good, and class size is around 18 students. Synopsis: Overpriced. A non-threatening place to learn German with an emphasis on verbal communication skills. A four week course will cost about 600€. Located in Wilmersdorf, the quality of the instruction is very good, and the teachers take their job seriously. The instructors are patient, friendly, and know how to teach. Classes have about 14 students. The Neue Schule has extracurricular activities, including tours of Berlin and excursions to nearby cities. Wi-Fi is available but limited to the main building. Synopsis: Friendly atmosphere with good instruction. Located in Schöneberg, the Hartnackschule is a bargain at around 200€ for a four week course. The quality of the instruction varies widely. Beware, some instructors are excellent, a few are okay, and some are just terrible. Class size runs around 24 students. The Hartnackschule tends to attract people residing in Berlin that need to improve their language skills for work or school. Accordingly, there is an emphasis on grammar rather than verbal communication. There are no extracurricular activities and no Wi-Fi. You get what you pay for. However, for the enthusiastic student who wants to learn German, this is the place to go. Synopsis: No frills but okay. Located in Mitte, the did Deutsch-Institut is pricey. A standard four week course will cost around 740€. Class size is small at around 10-12 students. The instruction is middle of the road. It’s neither good nor bad. There’s no course book, just daily handouts. Moreover, the Institut provides no Wi-Fi or extracurricular activities. Synopsis: Small classes with mediocre instruction. 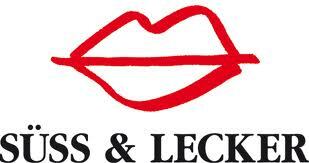 However, lecker isn’t universally used in the German speaking world. For example, the Swiss rarely use it. They prefer fein. And in the former East Germany, lecker was never used. Lecker or “tasty” conveyed a bourgeois and capitalist lifestyle, a word incompatible with the ideals of socialism. On Saturday the weather was terrible, and I spent most of the day indoors doing chores and catching up on work. I rarely watch TV these days, but when it rains, I give myself permission to engage in some relaxing entertainment like TV. I was lucky and found Singing in the Rain, known in Germany as Du Sollst Mein Glücksstern Sein (You Should Be My Lucky Star). I had never seen the movie, and it was weird watching it dubbed into German (fortunately, the songs remained in their original version). Interestingly, the transition between the dubbed German dialog and the American songs was done really well. I didn’t notice a difference. 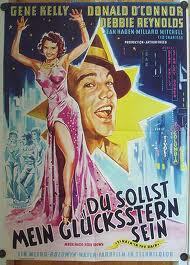 It’s how I would imagine Debbie Reynolds and Gene Kelly to sound like in German. In the movie, one of the character’s, played by Jean Hagen, has a strong Brooklyn accent. Somehow, the German actress dubbing Ms. Hagen’s voice managed to convey what a Brooklyn accent would sound like in German. She did a great job. Now, I can’t wait to see the original American version. Most Popular Saxon Word 2012? The radio station MDR 1 and the Sächsische Zeitung (Saxony Newspaper) recently conducted a poll to find out the most popular Saxon word for 2012. The word “Ditschen” (to dunk, as in, to dunk a cookie in milk) was number 1. In second place was the word “Plämpe” for a bad drink, and in third place “Hitsche” for footrest. You won’t find these words in a standard German dictionary since these are considered slang and used exclusively in Saxony (Leipzig and Dresden). Like many languages, German has a variety of dialects. Words used in one region may be completely unknown in another. For example, my favorite Berlin word is “mampfen,” meaning to nosh or munch. Although this word can be found in a German Dictionary, it is primarily used in Berlin and Brandenburg. I wonder what my favorite English word is. Ummm. I need to think about that.